Full discs of quality unbleached cotton sheeting are sewn with one row of stitching around arbor hole. Loose construction makes wheel extremely flexible. Also perfect for color buffing, irregular shapes, or hard-to-reach areas. Extra high-gloss finish! Made in USA. 6" wheel diameter. Fits 1/2"-5/8" arbor hole. For 1/3 HP buffer. 1/2" thick, 40-ply. Made in USA. 8" wheel diameter. Fits 3/4"-7/8" arbor hole. For 3/4 and 1-1/2 HP buffers. 1/2" thick, 40-ply. Made in USA. 10" wheel diameter. 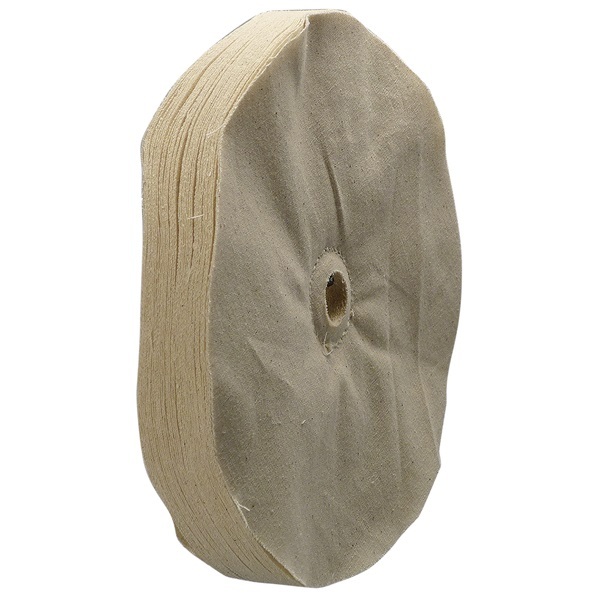 Fits 3/4"-7/8" arbor hole. For 3/4 and 1-1/2 HP buffers. 1/2" thick, 40-ply. Made in USA. I bought this to renew my finishing buffing wheels on my lathe. It is very aggressive and shreads them a bit more than I would like it to. However it does work and beats using 40-60 grit sand paper. I'd suggest using this first, then trimming any strings, then following with the sand paper.